Colorful. I love colorful food. What you see above is what came straight out of the slow cooker. No styling, no color editing…what you see is what you get. I think this is slow cooker food at its finest! Oh…and the #2 reason that I love slow cooking…it’s usually “dump and run.” This is one such recipe…and I love that it literally is no fuss. No need to peak, stir, vent…nothing. And the #1 reason…I can go about my afternoon and deal with the “attitudes of witching hour” without having to fuss with dinner prep. But really they should be a tie. #1 and #2 reasons are equally important for this busy mama! Place the chicken thighs into the base of the slow cooker. Drizzle the olive oil and vinegar over the top. Season with garlic powder, salt and pepper. 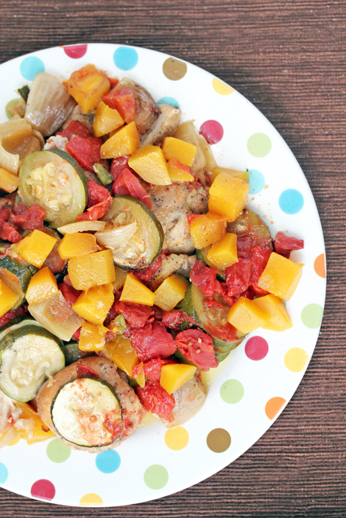 Place the diced red onion, drained diced tomatoes (or cut fresh tomatoes), zucchini slices and mango pieces over top and around the chicken thighs. Set slow cooker on low and cook for 8 to 10 hours. Dump and run! 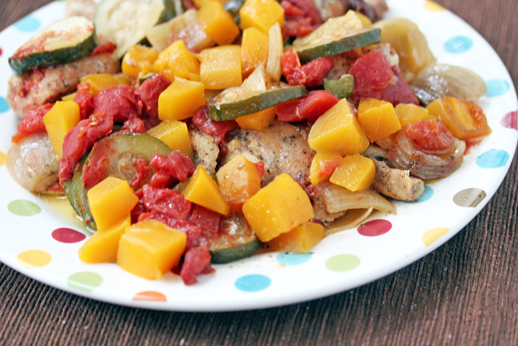 Serve Slow Cooker Mango Chicken with toast, as is, or with other simple side dish. This entry was posted in Recipe, Slow Cooker. Bookmark the permalink. I will make this with ripe pears since pears are what we have right now. I look forward to making this tomorrow. That sounds like a great idea! Did it work with the pears?!? if using fresh tomatoes, what is the liquid? The tomatoes and other veggies will make some liquid, so you don’t need to add any. 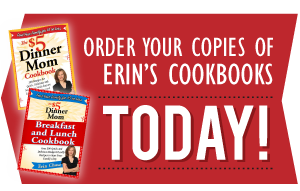 Pingback: It’s SLOW COOKER Week! I would Love to try this dish I can’t have tomatoes can I substitute something else? Do you think this would work with frozen mangoes? Hey Sophie! It sure would work with frozen mangoes! Making this now and smells great! I didn’t have time for the slow cooker so I am doing it cacciatore-style: sautÃ© zucchini and onion, then brown chicken, then mix remaining ingredients. Top chicken with veggies and pour tomato-mango sauce over all; simmer covered for 35 minutes or so till chicken is done. Serving with rice. My family can’t have vinegar, we usually use fresh lemon juice. I think I am young to try this with lime juice, though. Also I am starting this a little later than I wanted… Can I cook on high? And for how long? Most crock pot recipes I’ve seen are 4-6 hrs on high or 6-8 on low. The ingredients include red wine vinegar and olive oil – but they are not mentioned anywhere in the directions. When should they be used?? Sorry about that Celia…I’ve updated the recipe! My Wife is (very) allergic to zucchini (and all summer squash). What would make a good substitution? How about some small red potatoes cut up? Small potatoes would be great…or sweet potato chunks would complement the sweetness of the mango too! Hope you enjoy it! Can I freeze this recipe with the mangos included or should I freeze everything but the mangos and add them when I’m ready to cook it? Yes, you can free the mangoes with the chicken. I do that regularly when I leave slow cooker packs for my husband when I’m traveling for work! I am interested in doing the freezer meals, as you mention. Do you just put all ingredients, including the raw chicken into a large zip-lock and freeze? Yes Lisa…that’s what I do for this recipe when making slow cooker packs. Hope you guys enjoy it! Absolutely Kim…that would be a great addition! then become a deposit in another bank. No complications – Cord blood transplant or use for medicinal purposes does not involve any risks. Pingback: “No Thought Dinner” – What’s Yours? Muszę sie wam pochwalić w końcu zrzucilam – 8 kg. Przeszukalam chyba cały polski internet zeby znaleźć cos na odchudzanie i znalazłam.